Have you ever had a clog that a plunger couldn’t fix? In our home, we faced this problem a lot until I installed drain hair catchers. But once in a while we still have issues with the plumbing. As a result, we now have a drain auger to clear out pipe clogs. A drain auger, also known as a drain snake, is an essential tool. Once you learn to use it, the drain auger will save you time and money because you won’t need to call a plumber to fix most drain problems. Today I’ll discuss three of the best drain snakes, including the one I purchased for my house. I hope that this article will help you discover the perfect drain auger for your home as well. Once I asked a professional plumber to teach me how to use an auger to unclog a pipe. He was at my home performing that very task. I quickly realized it wasn’t hard to clear a clog with a drain snake. It mainly required patience. When I began shopping for a drain auger, I wanted one that would be straightforward for myself and others in my family to use. I ended up with the Vastar Drain Snake which I will describe for you now. Vastar’s bright orange drain augers are less than two feet long, which is sufficient to clear sink and shower drains of hair and debris. They come in a pack of three, so you can store one in each bathroom plus the kitchen. 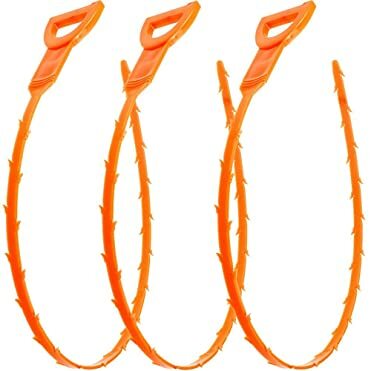 These plastic wands have barbed points that hook onto obstructions like hair and food chunks. One end of the wand has a loop handle to help you manipulate the auger as you fish for debris. Once you feel you’ve latched onto the blockage, just slowly retract the snake to remove it and the gunk along with it. Although they are made of durable ABS plastic, the augers are flexible enough to enter smoothly in the U-shaped part of the pipe under your sink. This section is called the P-trap, and it’s where you’ll find most of the clogs. One of the best features of the Vastar Drain Snake is that you probably won’t have to remove pop-up stoppers to clear clogs. The snake, even with its barbs, comfortably fits into most drain openings. Another highlight is that Vastar offers an 18-month warranty on the augers. Their customer service is also prompt in answering questions. In summary, the Vastar Drain Snakes are easy to use in a variety of sinks, tubs, and shower drains, and they won’t scratch the porcelain. They will save you from spending money on chemical drain cleaners and plumbing services. But what if you can’t clear a blockage because it’s too far down for the Vastar Drain Snake to reach? You might prefer the next tool instead. You may discover that you need a longer auger. Here is one that you can insert in household drains as well as outdoor downspouts. 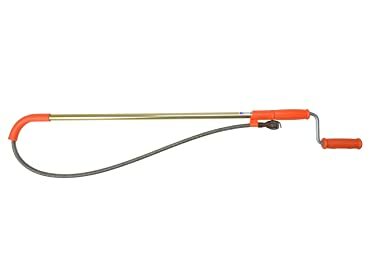 The Dr.Drain plumbing snake is a 25-foot long flexible coiled wire that will reach much farther than the Vastar tool can. One of my favorite features of this auger is that it coils up inside a plastic drum for storage. The drum has a screw you can turn to lock the cable when you want to move the drain snake around inside the pipe without extending it further. You can also see that the auger has a pistol grip that you hold in one hand while you turn the wheel on the drum with the other. Depending on the direction you turn, the steel cable extends or retracts. Once you sense the blockage, you can work it loose, then flush with water to see how it drains. There are two things to watch out for when you use a tool like the Dr.Drain pipe cleaner. One, it doesn’t have a rubber tip so it could leave scratches on the porcelain of your sink or toilet. And two, it’s smart to clean it, let it dry, then oil it before you store it. Perhaps you need an auger with an intermediate length, something more extended than the Vastar but shorter than the Dr.Drain Snake. In that case, check out the next tool below. General Pipe Cleaners Toilet Auger is six feet long and quite sturdy. It’s made of tempered steel spring coiled over 49-strand wire rope. At the tip, you’ll see what they call a “down head.” This type of point is useful for penetrating into contours without getting stuck and shoving obstructions out of the way. The aluminum handle contains half the drain snake inside it, and it has a vinyl guard at its tip. You can insert the handle with the guard into the opening of your drain or toilet without scratching the porcelain. Then just turn the crank handle to extend the rest of the snake into the pipe. In summary, this drain auger has user-friendly features and comes with with a one-year warranty against defects in all of its parts. I wanted a tool easy enough to operate that anyone in the family could use it successfully. The other essential point was that the auger needed to reach the majority of clogs which are necessary to clear. Lucky for us, the Vastar 19.6-Inch Drain Snake fit both of my criteria. But you may find that the other two augers I reviewed are better for your needs. Let me recap the best features of the three drain snakes here. The Vastar Drain Snake – the best drain auger for me – is long enough to reach into the P-trap under a sink to retrieve blockages caused by hair or debris. Plus, it’s made of ABS plastic that won’t scratch pipes or porcelain. You can use it with only one hand, and insert it even if you have a pop-up stopper. The Dr.Drain Plumbing Snake is 25-feet long, ideal for when you have a far-off clog deep in a pipe. It winds up to store neatly in a plastic drum. 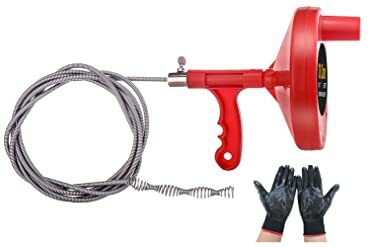 Meanwhile, General Pipe Cleaners’ Toilet Auger offers six feet of sturdy steel cable to clear most household drains and toilet blockages. Its aluminum handle has a vinyl wrapper that keeps the tool from scratching your porcelain. In conclusion, you might decide to purchase more than one drain auger, depending on your needs. Fortunately, they are inexpensive tools that can save you a lot of money in the long run. And I hope you found the perfect ones for your home today.